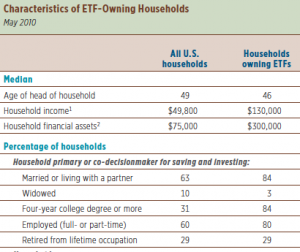 Christian Magoon recently spoke with Investment News about the demographics of ETF owners compared to mutual fund owners. It turns out that ETF owners are more educated, have higher household incomes and maintain a larger base of liquid assets. Data and chart from ICI Factbook. Christian Magoon spoke with Registered Rep magazine about the growing trend of financial advisors seeking to launch their own strategy in an ETF. With dramatic events in the Middle East and the corresponding strong performance of oil and oil related companies over the last six months, many investors are taking a fresh look at investing in oil. In late March Christian Magoon spoke to MarketWatch about investing in oil using ETFs. There are a variety of oil ETFs available with many containing differences in underlying product structure, type of security owned and investment objective. Magoon cited the first consideration for potential investors in oil ETFs to be whether they want an ETF that invests in oil futures or in oil related companies. The asset class of commodities has been a new addition to many investor portfolios over the last five years. The benefits of investing in commodities include increased portfolio diversification and lower correlations to traditional asset classes. Commodity investing however isn’t always as straight forward as investing in stocks and bonds. For example, unique situations like contango and backwardation can occur when investing in certain commodities. Christian Magoon recently spoke with U.S. News and World Reports about commodity investing and highlighted several commodity ETFs. A flurry of bond ETFs have launched over the last two years while interest rates in the U.S. continue to hover at or near historic lows. These ETFs, like bond mutual funds, have received significant inflows from equity weary investors. Is this all a sign of a bond bubble? If so, what’s a bond oriented investor to do? Recently, Christian Magoon and Tom Lydon, editor of ETF Trends, spoke with The Street about bond ETFs. Each highlighted several bond ETFs to consider by those concerned about a potential bond bubble.